After Bella passed, my brother-in-law asked me if I would like to have molds made of Bella’s hand and foot. It would be a small piece of her I could keep forever. I was in a fog and don’t remember the details, but I know the funeral home went above and beyond to meet my request and make the impressions. I will forever be grateful for this gift. When the impressions were brought to me, I was staying with my parents and that’s where they remained for well over a year. I came across someone online who casted beautiful keepsakes (including hand/foot impressions) and I asked her if she could make something for me out of the impressions I had of Bella. She wasn’t sure what she could do but asked me to take photos of the impressions I had. The molds of Bella’s hand and foot finally made it home! I recognized the black bag Bella’s urn came in, but when I looked inside, I assumed I was mistaken as my son’s drawings were inside. I put the bag on a chair in my kitchen and it somehow ended up on the floor. When I picked the bag up, I reached inside to see what else was inside. I knew the instant I felt clay that the bag was in fact from Bella’s urn. I realized the molds of her hand and foot were in there. I removed the first piece of clay; I was in disbelief as I looked at the broken piece of my daughter’s foot in my hand. Shock set in and grief shattered me all over again as I struggled to breathe. One of the last pieces I have of Bella was broken. I felt as though I was experiencing her death all over again. I wrote about the experience HERE. Shortly after posting the story on my blog, my dentist contacted me and wanted to see the mold as she knew someone who may be able to help fix it. Months went by and I finally made the trip to meet with the man from the dental lab. He wasn’t able to help me, but told me about a local woman who does casting and purchases supplies from the lab. He also told me about a new chiropractor clinic down the street who casts feet for orthotics. I felt as though I was on a wild goose chase for someone to help me. The man at the chiropractor/orthotic clinic didn’t know if he could help but offered to do research for me. I’m sure it was a little shocking to have a complete stranger stop by with her deceased child’s broken foot in a box desperately hoping for someone to fix it. I appreciate the kindness and respect shown to me but began feeling my situation was hopeless. My next stop was to deliver a book to a dear friend. The visit was short but this woman’s energy always uplifts me. I told her about the impression of Bella’s foot and she immediately suggested I contact “Lynne.” I’m not sure how I knew who she meant but I instinctively knew she was right! “Lynne is the person the man at the lab told me about!” I immediately realized that “Lynne” was also the person I asked to make me a precious keepsake out of the molds in the first place. I never did get back to her. I found Lynne’s business page, To Have & To Hold Belly Casting & More, on Facebook and immediately sent her a message. She got back to me within minutes and an hour later I was standing in her kitchen with Bella’s foot on her counter. Love and compassion radiated from Lynne and I could tell she really wanted to help me; however, she didn’t have any experience fixing molds. I was asking her to step out of her comfort zone; Bella’s foot was irreplaceable and there was no room for error. We didn’t even know what type of clay the impression was made from. I felt Bella’s presence surround us and I felt complete trust in her. I left the molds with Lynne and knew she was capable of fixing this shattered mess. I trusted the process and put all my faith into the universe expecting a miracle! Lynne kept me updated throughout the process. The first obstacle was determining the type of clay the impressions were made from. I contacted the director of the funeral home and asked her what type of clay she used; she wasn’t sure but said it was from Dollarama. I suddenly remembered a package of clay I had in my closet. I had an urge to buy it when I was at Dollarama one day. I have no idea why I bought it but figured I’d need it. (Thankfully, I always trust my intuition!) I snapped a photo of the package of clay and sent it to the funeral home director. She recognized the package. Unfortunately, this type of clay is very fragile and would eventually disintegrate over time. Lynne consulted with many experts around the world and knew she would have to glue the pieces together, but finding a glue that would hold without damaging the clay wouldn’t be easy. The pieces needed to be strong enough to withstand the pressure to take an impression. Her first attempt failed and the glue didn’t hold, but the second type of glue held, but would it be strong enough? I left the rest of to Lynne. She managed to make an impression of the glued mold, then made an impression of the impression. The process was long and stressful, but it was a success! I trusted that she would make something beautiful for me. She explained that the material she uses is as hard as stone and wouldn’t break. After 3 months, I finally got to see the results! I picked up the gorgeous pieces and they were even more beautiful than I had imagined! Lynne created two shadowboxes, one with the imprint and one with the outprint. 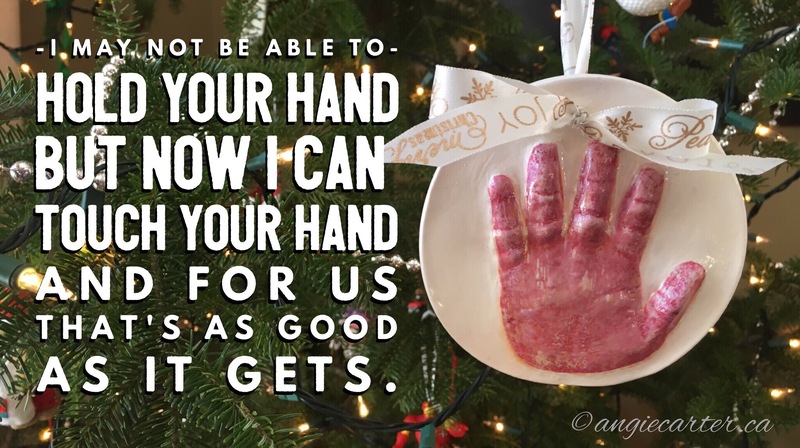 She even made a Christmas ornament for me so I would be able to touch Bella’s hand any time I want. This incredible woman managed to give a piece of my daughter back to me. No one can bring Bella back, but she was able to bring her foot back, and that’s as good as it will get for me. This gift from a stranger, this random act of kindness, helped mend a few cracks in my grieving heart. A piece of Bella came home and is now on my wall for me to look at every single day, all thanks to one woman. She put countless hours into researching and even more hours completing the process. I know this was a complicated procedure, but I also know she had a little assistance from Bella. 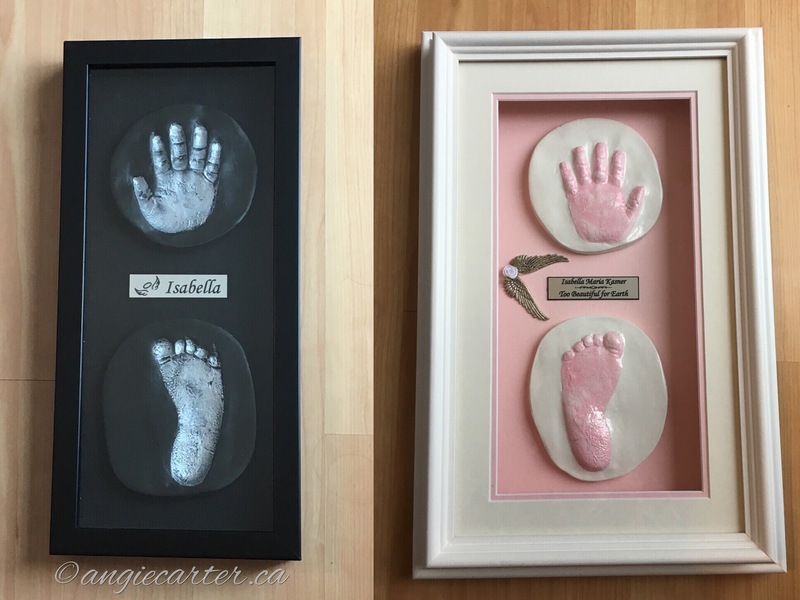 If you are in the Timmins area and know someone who experiences the loss of a child, please let them know about Lynne at To Have & To Hold Belly Casting & More and give them the option to have a precious keepsake created of their child. It’s a gift that is everlasting!